What Is Going On With The Lira? Banks react to the Turkish Lira plunge. The key driver of Turkey’s problems of late are political not economic. Turkey, under the recently re-elected President Recep Tayyip Erdogan, is no longer in the Western camp, as was made extraordinarily clear by the Donald’s gratuitously provocative tweet last Friday when he stated that he has authorised a doubling of tariffs on steel and aluminium imports from Turkey. The Turkish lira is enjoying a spectacular rally: +12% vs USD in two days. Admittedly, TRY remains 20% weaker since end-July and -43% in 12m. So what is pushing the lira stronger as general market confidence is not restored yet? We said that the Turkey crisis has limited potential for global spillovers . However, Turkey's fundamentals remain mostly unbalanced. US Dollar / Tturkish lira is this morning trading around the 5.8 level. Although this is still a very elevated level, it is around 20% below its recent high. The Lira found support yesterday in news that Qatar has pledged to invest USD15 bln into the Turkish economy through economic projects, investments and deposits. It has also emerged this week that China’s Alibaba has acquired a stake of its Turkish counterpart Trenfyol as part of its bid to expand its global platform and that Russian officials were in Ankara for top level meetings. The news comes at a time of fractured relations between US and Turkey and is evidence of Turkey’s increased Eastwards bias. [The emerging market shares crash] is correctly reflected via Argentina and Turkey first due to their higher sensitivity to global funding conditions,yet we also think that it will impact the rest of EM negatively, meaning moving to a bearish stance across the asset classes is justified despite recent weakness. Indeed, the risk is increasing that we overshoot our already bearish EM forecasts for 3Q18. Supporting our bearish stance is that we don't think that DM will be immune to the global factors highlighted above, with the S&P 500 and US credit coming under pressure. China holds by far the largest stock of USD-denominated non-financial corporate debt: USD 548 billion. Turkey is number three in the diagram, but in percent of GDP, its corporate dollar debt is almost six times that of China’s. Non-US companies issue debt in dollars partly because of the high interest costs and inferior liquidity of local currency debt. Corporations, seeking lower interest costs, effectively take on the associated currency risk. Some of the issuers of USD debt are exporters with USD receivables, but many have major asset-liability mismatches. We suspect the strong USD buying (through cash and forward markets) witnessed in China in recent weeks came from Chinese corporates frantically trying to hedge their USD exposures. Similarly, the explosive move in US Dollar Turkish lira has probably been propelled by Turkish corporates laden with USD debt. In a recent report we argued that emerging market (EM) economies are generally better able to service their external debt than they were 20 years ago.1 Consequently, we do not think that a wave of Turkey-like financial crises will sweep through EM economies as they did in 1997-1998. The proverbial hole in the wall for markets this last week has been Turkey. However there were quite contrasting moves yesterday as Turkey rallied but the rest of the risk complex started to see a delayed reaction. 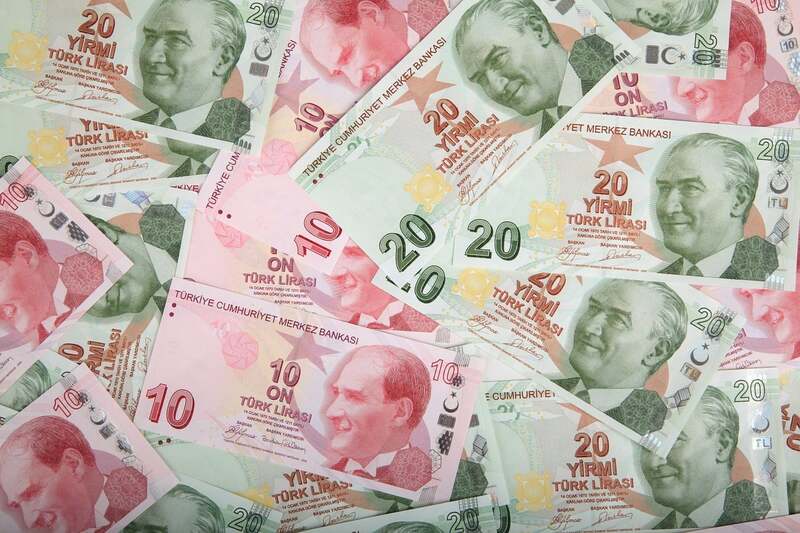 The Turkish lira rose +6.36% (17.4% from intra-day lows on Monday) firstly because of early morning moves by the Banking Regulation and Supervision Agency to limit funds’ access to lira liquidity in the offshore swap market and later in the day on headlines (per FT) that Qatar plans to invest $15bn into the Turkish economy. Qatar pledged to invest $15bn in Turkey. This announcement was made by both the Turkish and the Qatari administrations yesterday. The investment package comprises FDI projects, but there were no details available.